^ a b c d e Dawson, P. C.; De Robertis, M. M. (2004). “Barnard's Star and the M Dwarf Temperature Scale”. The Astronomical Journal 127 (5): 2909-2914. doi:10.1086/383289. ISSN 0004-6256. ^ Benedict, G. Fritz; McArthur, Barbara; Nelan, E.; Story, D.; Whipple, A. L.; Shelus, P. J.; Jefferys, W. H.; Hemenway, P. D. et al. (1998). “Photometry of Proxima Centauri and Barnard's star using Hubble Space Telescope fine guidance senso 3”. The Astronomical Journal 116 (1): 429. arXiv:astro-ph/9806276. Bibcode: 1998AJ....116..429B. doi:10.1086/300420. ^ Gizis, John E. (1997). “M-Subdwarfs: Spectroscopic Classification and the Metallicity Scale”. The Astronomical Journal 113 (2): 820. arXiv:astro-ph/9611222. Bibcode: 1997AJ....113..806G. doi:10.1086/118302. ^ a b c d Burnham,. Jr., R. (1978). Burnham's Celestial Handbook. Dover Publications. pp. 1251-1252. ^ Bobylev, V. V. (2010). “Searching for stars closely encountering with the solar system”. Astronomy Letters 36 (3): 220–226. arXiv:1003.2160. Bibcode: 2010AstL...36..220B. doi:10.1134/S1063773710030060. ^ a b c d e f g h Ribas, I. et al. (2018). “A candidate super-Earth planet orbiting near the snow line of Barnard’s star”. Nature 563 (7731): 365-368. arXiv:1811.05955. Bibcode: 2018arXiv181105955R. doi:10.1038/s41586-018-0677-y. ISSN 0028-0836. ^ Gatewood, George; Eichhorn, H. (1973). An unsuccessful search for a planetary companion of Barnard's star (BD +4 3561)journal=The Astronomical Journal. 78. p. 769. Bibcode: 1973AJ.....78..769G. doi:10.1086/111480. ^ Bond, A.; Martin, A. R. “Project Daedalus – The mission profile”. Journal of the British Interplanetary Society 29 (2): 101. Bibcode: 1976JBIS...29..101B. オリジナルの2007-10-20時点によるアーカイブ。. https://web.archive.org/web/20071020144727/http://md1.csa.com/partners/viewrecord.php?requester=gs&collection=TRD&recid=A7618970AH&q=project+daedalus&uid=788304424&setcookie=yes. ^ a b c Ribas, I. et al. (2018). “A candidate super-Earth planet orbiting near the snow line of Barnard’s star”. Nature 563 (7731): 365-368. arXiv:1811.05955. Bibcode: 2018arXiv181105955R. doi:10.1038/s41586-018-0677-y. ISSN 0028-0836. Schmidling, Jack. “Barnard's Star”. Jack Schmidling Productions, Inc. 2019年1月6日閲覧。 Amateur work showing Barnard's Star movement over time. Johnson, Rick. “Barnard's Star”. Universe Today. 2019年1月6日閲覧。 Animated image with frames approx. 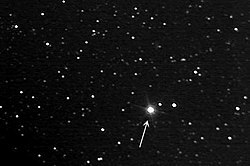 one year apart, beginning in 2007, showing the movement of Barnard's Star.